Former lawman Rance Toller and his lover Angie Sutter foil a stagecoach robbery just outside the frontier settlement of Tombstone, Arizona, and in the process capture the notorious gunfighter Johnny Ringo. As a result, Rance is persuaded to accept the vacant position of town marshal, formerly held by one of the famous Earp brothers. Unfortunately, he soon falls foul of the Big Silver mining operators led by E.B. Gage, who want the law on their own terms. With the dubious help of his new friend, Doc Holliday, Rance has to fight for his life against Gage’s ruthless enforcers, as well as take on a band of murderous cattle rustlers and the vengeful Ringo, who has escaped a jail cell with mysterious ease. It is not long before brutal bloody violence explodes on the streets of Tombstone. Paul Bedford combines both real and fictional characters in this, the third, book of his to feature Rance Toller and Angie Sutter, the others being The Devil’s Work and The Outlaw Trail. The inclusion of people who really lived is not something new in Paul Bedford’s work as most, if not all, of his seven Black Horse Westerns have also had roles for them too. What I like about this one, is that Rance has no idea who Ringo, the Earps, or Doc Holliday are and is certainly not in awe of their reputations. Ringo’s attempt at getting revenge for being captured and jailed by Rance sees an escalation in violence as Toller’s life becomes a mission to bring Ringo down. 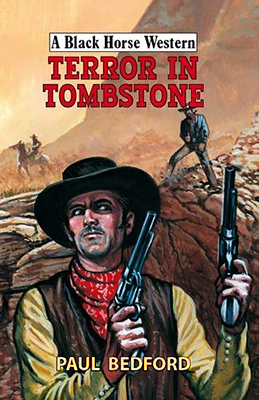 The town of Tombstone will erupt as dynamite and bullets fly almost non-stop making this an action-packed story. Terror in Tombstone is a fast-paced read that thoroughly entertains and leaves me looking forward to Paul Bedford’s next book, The Deadly Shadow, due out in August. Once again Tell Cotten has written a very difficult to put down book. Split into a number of different parts and told in the third person Tell Cotten often switches between the various characters, more often than not leaving them in a dangerous situation that will ensure you keep reading. The previous books have always had very strong female roles and this continues that tradition with Rachel Landon and April Gibson having to find hidden strengths to survive being kidnapped by the Apaches. The why is something the Landon men will have to struggle to understand but of course this is less important than getting their women back. Lee Mattingly will also have to fight another battle, that of admitting his love for April and having to compete with another posse member, Jeremiah Wisdom, for her heart – if they succeed in getting her back alive. Tell Cotten fills the book with action, be it gunplay or a deadly storm that produces some life-threatening flooding. Dialogue is believable and often laced with humour. There’s also a couple of neat twists, not least the introduction of a new Landon family member – but can he be trusted? 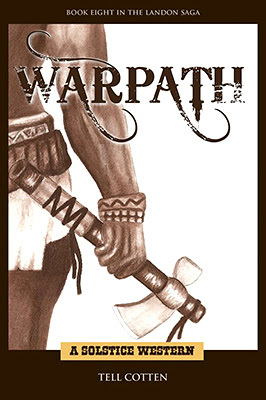 Like the earlier stories this one can be read as a stand-alone novel as the author includes enough information on what has gone before to fill new readers in on the events that continue those begun in previous books. To really appreciate all the relationships and past struggles I would very much suggest you read the whole series in order. In my opinion Tell Cotten is right up there with the very best western authors writing today, or in the past, and I am really looking forward to book nine in the series. Mort Basset – the powerful owner of the Slash B ranch – thinks he and his men have got away with the killing of the Cadman family, when the corrupt Broken Mesa court finds them not guilty. But Basset and his men sound find that this is not to be. The men involved in the murders begin to be hanged or shot dead by an unseen avenger, and they soon find that the man they are after is a deal cleverer then they anticipated, and the killings continue. Where will it end? I’ve only read a handful of Elliot Long’s thirty plus Black Horse Westerns and I’ve enjoyed them all. 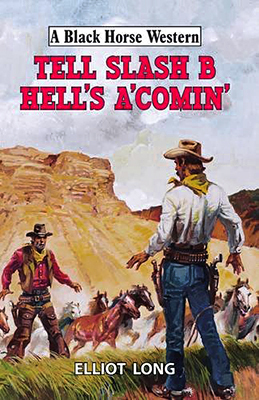 Tell Slash B Hell’s A’Comin’ certainly enforces my thoughts that Elliot Long is a writer worth taking the time to read. The story begins with the Slash B dealing out what they see as range justice, even though their foreman, Jim Alston, tries to stop the killing and also fails to stop the murder of the rest of the Cadman family. Elliot Long then introduces a handful of other characters, all of whom are sickened by the fact that the court finds the Slash B crew not guilty of murder, and you’ll soon be wondering if one of them is the person avenging the Cadman’s deaths. Elliot Long sure knows how to pace a story and I soon found myself unable to put the book down because of my desire to find out who the mystery killer was. The story is mainly told through Jim Alston but does occasionally switch to one or two of the other characters, such a lawman Talbot Dixon who’s doing his best to stop the assassination of the Slash B crew yet also seems to think, and support the fact, that they are getting nothing more than they deserve. Of course this line of thinking causes friction amongst the posse members which is a mix of townsfolk and Slash B riders. As you read the story you might think you’ve worked out how the tale is going to end and it’s there that Elliot Long springs the biggest surprise of the tale that left me cursing and grinning and nodding in satisfaction that the book just couldn’t end any other way could it? If you get the opportunity to read this book then don’t hesitate to do so and once you’ve finished it, like me, I'm sure you’ll be left eager to read more of Elliot Long’s work.